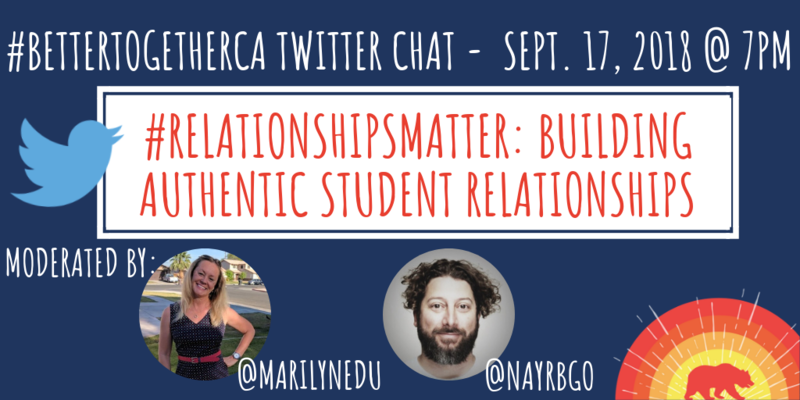 For our September #BetterTogetherCA Twitter chat, we’ll be chatting about how much #RelationshipsMatter and how to build authentic relationships with students. This chat with be moderated by Marilyn McAlister, a 2018 Better Together: California Teachers Summit EdTalk Speaker whose EdTalk was titled #RelationshipsMatter, and Bryan Sanders, another Summit EdTalk Speaker and NBCT. Marilyn McAlister has been an educator for 24 years. She currently teaches sixth grade in El Centro, California. In 2017, Marilyn was honored to be named Teacher of the Year for the Imperial County and became a Google Certified Educator. She’s passionate about building relationships, Google tools, inquiry-based learning, and developing student-leaders. She’s presented at EdTechTeam Google summits and CUE events. Marilyn says that Twitter and her global PLN have transformed her as a connected educator. She would love to connect @MarilynEdu.